It has been quite sometime that I have not pen down my thought on Malaysian politic. From my personal observation, money politics, corruption, accusation, cronyism and unethical norms of the politicians become mundane in the Malaysian political arena. I am not sure whether the sense of brotherhood, nationhood, solidarity is still embedded in the heart of the politicians. People put their eminent hopes to the politicians but it seems that they are just too busy with their political pinata. (1) The Sultan should dissolve the State Assembly and calls for a new election. Perak state constitution: Artikel XVI(6): If the Mentri Besar ceases to command the confidence of the majority of the Legislative Assembly, then unless at his request His Royal Highness dissolves the Legislative Assembly, he shall tender the resignation of the Executive Council. This provision states that the Chief Minister is only legally obliged to step down when a motion of no confidence on him has been passed in the state assembly, but not otherwise. (2) Unnecessary election should be avoided and the Sultan has his discretionary or prerogative power to decide. At this point, I tend to concur with Prof Dr Abdul Aziz Bari of International Islamic University of Malaysia (IIUM) where he said that several provisions in the Constitution indicated that unnecessary elections and by-elections should be avoided. It is for the Sultan who has power to decide whether to dissolve the State Assembly or not. As long as any political coalition has the composition to form a new government, unnecessary election should be avoided which may lead to furthering unneeded cost, time and efforts. Whatever it is, the people of Perak have opportunity to decide and cast their votes in the 13th general election and this constitutional conundrum should provide a great lesson to both disputed parties. Just a matter of waiting for another few years. 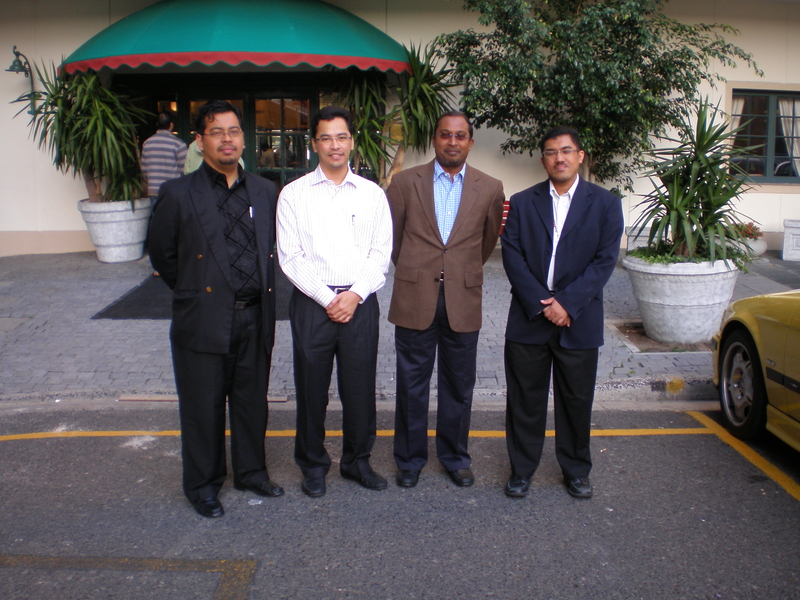 With Yang Amat Berhormat, Datuk Dr. Zambry Abdul Kadir, a new Chief Minister of Perak (second from right) in Cape Town, South Africa. It is a great hope regardless of political ideology that he can serve the people well with integrity and honesty.